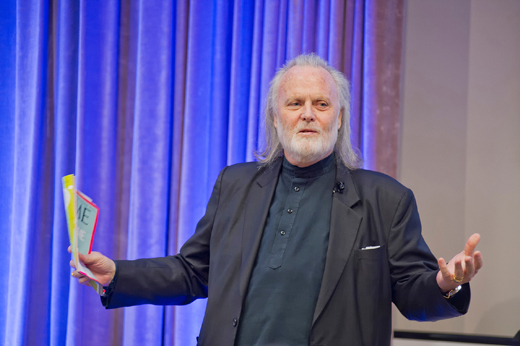 Isaac Tigrett, founder of both the Hard Rock Café and the House of Blues, was the keynote speaker at Goizueta's annual Undergraduate Business School Leadership Conference. Photo by Tony Benner. Dreaming of starting a business as successful and groundbreaking as the Hard Rock Café? All you need is love — wait, The Beatles said that. But so did Isaac Tigrett, founder of both the Hard Rock Café and the House of Blues, to the audience in the Goizueta Business School auditorium on Feb. 6. Tigrett was the keynote speaker at Goizueta's annual Undergraduate Business School Leadership Conference. Love was the motive behind every one of his entrepreneurial ventures, Tigrett said, from re-selling classic Rolls Royces, to opening the Hard Rock Café then the House of Blues, to his current proposal for a Mystic Inn of the 7th Ray. With his first £600 earned as a dough boy at Carr's Biscuits in England, Tigrett bought a 1957 Rolls Royce Silver Dawn he intended to give — out of love — to his mother. Instead, he took an offer of $35,000 for it then sold more of the cars, amassing $250,000 by the time he was 18 years old. "So I took that money and eventually opened an altar to these heroes, these musicians, [Jimi] Hendrix, The Beatles, Clapton, the Who, Led Zeppelin — I actually had them arrested one night. I wish I had a dollar for every celebrity I've thrown out of my places, I'd be a rich guy. And I wish I had a dollar for every lawyer I fired. I'd also be a rich guy." At that point in history, "music became the international language. It is still. It transcends borders, backgrounds, age groups, cultures, everything," he said. Tigrett said he was blessed to go through the most incredible social change of the 1960s, calling it "a soup that was so fantastic only God could have put up the recipe," ticking off the women's movement, the Pill, the Civil Rights movement, assassinations, bodies in the streets, buildings burning, nuclear threat, Vietnam War." After founding the Hard Rock, Tigrett targeted the blues as authentic, American, demographically broad, for the whole family. "I saw this opportunity, which I never thought I'd see again in my lifetime to take a culture, put an umbrella over it, create an icon," he said of the House of Blues brand. But this time, "we weren't just using culture, we were producing culture," referring to the music and film production that came out of the franchise. "When I did the Hard Rock Café and the House of Blues, the motive was love, it was love. Money is a byproduct of doing something you enjoy really, really well. Put the money first; you're dead. It's no fun. If you don't put human values into your business, mutual respect, love for everyone. "I know it sounds corny but that's the secret to my success." The self-described "weird cat from Jackson Tennessee" said his entrepreneurial nature came from a family of Baptist ministers plus some Scottish entrepreneurs: "They used to rub nickels together to see if they'd mate. So I had one foot in the spiritual world and one in the material world." People think these two worlds are impossible to put together but they are actually interwoven, he added. Tigrett told the students, "This is a new cultural revolution that you're in the midst of. I'm hoping you can change all of those mistakes that our generation made because we screwed up everything. We didn't change a damn thing. "Yeah, we wanted to change the world but we decided it was better to merchandise it." A Goizueta student asked Tigrett: "You were talking about how your generation let down their mission. Watching the Super Bowl the other night, I saw [iconic protest singer] Bob Dylan is selling cars now, selling Cadillacs. Is that sort of what you're talking about?" "I didn't know Bobby was selling Cadillacs!"